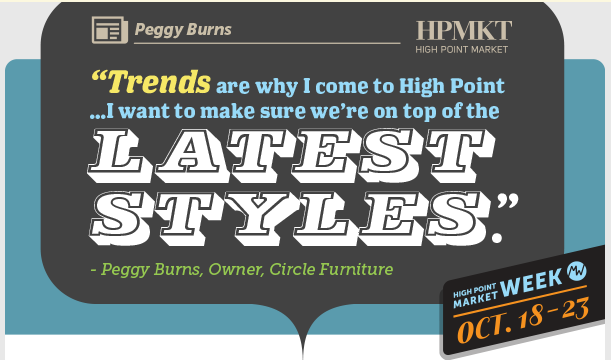 Style Spotters expect High Point to showcase the bright, bold, and brassy. Market-goers seek out four things when they arrive in High Point – their friends, new connections for their business networks, innovative ideas, and the latest trends. It’s a ritual, and High Point is the only place where all four converge at the start of each new season. And when it comes to trends, it’s the place where all the hip and edgy styles, the hot colors, and fabulous new functional features debut. Part of the fun of Market Week is discovering what’s rising on the furnishings and accessories horizon. What colors and patterns will lead the year? Which finishes will dominate the showrooms? Let’s take a quick peek into the future, and see what might emerge in High Point this October. To get the inside track on what to look for this fall, we asked a few of our 2014 Style Spotters for their forecasts. Hint: It looks colorful. That’s a sentiment shared by Gary Inman, principal and director of hotel and home design, Glavé & Holmes Architecture, Richmond, Virginia. “Reds ranging from corals and pinks to more intense garnets and vermilion will emerge as preferred hues. We’re certainly seeing this color family in fashion and beauty products.” Inman should know. He spent five years in the New York fashion industry before shifting to interior design. Anyone who’s been around for the last couple of Markets knows that blue has been a winner, and it appears the color’s not slowing down. “Blue will remain very strong with cobalt, lapis, and robin’s egg as fresh additions to navy and indigo,” says Inman. “It’s really big now,” says Beach of blue, “all shades.” Beach recently specified two blue sofas for a couple. The husband was a bit leery, but once the sofas were installed, he was a color convert. “When people enter their home and see the sofas, their mouths drop open,” Beach says. Beige bows out and gray is coming in. “It’s the new neutral,” says Beach. “However, the middle of the country is a bit slower to latch onto this color trend,” she notes, referring to her Midwestern client base.